Children's Library Furniture: See Our Best Sellers! Children&apos;s library furniture helps little ones get a head start on reading. A cozy and appealing library will demonstrate the power of books. What kind of furniture should be in a children&apos;s library? Enticing children&apos;s book displays and cushy seating will attract both experienced and new readers to the world of literature. At Hertz Furniture, we have all of the school library furniture you need for an appealing reading room. 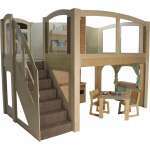 Our selection comes from top manufacturers who specialize in children’s furniture. Whether you want to furnish a whole school library or simply refurbish your preschool reading corner, you have come to the right place. What is the best kind of book display? 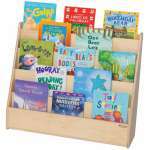 We have a large selection of children's book displays, so you have many options to choose from. Giving books prominent placement where they are clearly visible is particularly important for young children. Beginning readers, and even younger children will be enticed by the exciting covers of the books you put on the childrens bookcase, and will be inspired to look inside. They may even recognize a few favorites from home, which will give them all the more reason to feel comfortable in the reading space you have created. If you want a book display that fits against a wall to include in your children’s library furniture, we have single-sided options in a number of sizes. Double-faced childrens bookcases will fit well in the center of a room, or as a divider between two preschool learning centers. If you want a larger display with a more unconventional shape, we also have book display stands in creative shapes such as a house shape and a train shape. With lots of spaces and compartments, you can display many different types of literature. If you want to add even more flair, try Educational Edge library furniture for a fun splash of color. How can I make sure all the kids see the book at story time? Do you like to have a story hour in your library? Are your students having a hard time seeing the pictures when you read to them? A terraced reading corner gives children a comfortable place to sit and read independently or for a teacher to read a book to the class. A reading terrace enables all children to view the book easily as an adult reads to them. What kind of seating should I get for the childrens library? No children's library or children's book section is complete without some cushy toddler chairs. 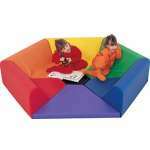 Comfy, colorful urethane-foam padded seating from Children's Factory comes in a number of different designs. These child-size club chairs and sofas come in bright, eye-catching colors that will liven up any reading space. Appropriately-sized chairs encourage little ones to take initiative and read to themselves or explore a new book. Cube furniture is perfect for young explorers. It can be used either as tables or seating, depending on what the children want. Bean bag chairs are another great choice. They mold to the shape of the person seated in them for a perfect fit. For the most accommodating library, order a combination of different types of seating to suit varied preferences. For your youngest learners, Brand New World has cushy toddler sofas and armchairs in vibrant colors. If you prefer to sit on the floor and read, we offer a number of floor cushion configurations. They provide padding on the bottom as well as back support. This is a great way to section-off a reading area so many children can enjoy books together or read with a caregiver. With Hertz Furniture's great selection of children's library furniture, you can easily find some great pieces for your reading space. The more comfortable and exciting your kids library furniture is, the more little ones will want to come in and find great books to curl up with. When children get excited about reading from a young age, they are likely to continue appreciating literature and exploring new things.